I’ve had the recognition in the past couple weeks that I have learned forms to complete tests without having the knowledge about what happens during these forms. 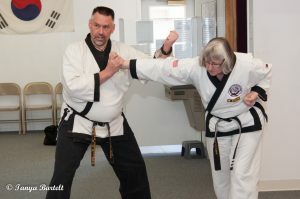 This is particularly in regard to my Haidong Gumdo training, but there is some Taekwondo as well as I prepare for my next test. I have preached to my students in the past few classes that if they are only doing the pattern without understanding the applications, they don’t truly KNOW their form. 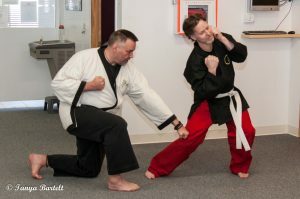 I had the recognition today, during a black belt class, that I have faked my way through a few tests. It was quite eye-opening! I have determined that the only way I truly learn any form is by figuring out the pattern, then figuring out the words to tell someone else how to do the form and, finally, learning the story that goes with the form so I can understand the application of techniques within the form. Well the words and the application may flip/flop according to my training time and the teaching requirements. This is a wonderful breakthrough in my own training as I have tended to be at the front of curriculum and development. I don’t really care if students or others catch up to me. I want to understand the training that I do and present the best possible material to my students. I have always believed that it is my job to help students get to my level of knowledge faster and easier than it took me. They should understand MUCH more than I ever have and be able to provide the next generation with even more information and knowledge.